Yesterday, I joined the ranks of Real Cooks. Yesterday, my cooking hobby became legit. Yesterday, I BOUGHT A FOOD PROCESSOR. After months of listening to Melba Toast talk about how amazing her food processor is, and how it has changed her life (a topic soon to be addressed by a blog post, I believe), I finally broke down and got one. Well, it wasn’t exactly that easy. To be fair, my gentleman friend J sort of talked me into it. “They are too expensive,” I whined. He pointed out that we had one of those famous 20% off coupons at Bed Bath & Beyond… and after all, if we SPLIT the cost of it, it wouldn’t be that much, right? After much cajoling and extensive research on his part (seriously, the dude did more research on food processors than most people do on cars), and armed with our coupon, we settled on this puppy, an 11-cup beauty with a chopping blade, dough blade, slicing disc, and shredding disc. AND A DVD. I was immediately in love. As soon as we got home, I sat down and watched the DVD. OHMYGOD I can make salsa! And gazpacho! And slice anything!!!!! J pointed out that all we really wanted to do tonight was make pesto. Oh. Right. So make pesto we did. And damn, it was delicious. And took about 5 minutes to make, plus the time to shell pistachios. Warning: As you can see, this recipe makes a HUGE amount of pesto. Like, ridiculous. You can easily halve it, or spread the leftovers into an ice tray to freeze. Then, you can pop them out and have a perfect serving size of pesto for any night. Place the garlic, pistachios, and basil into the food processor. Pulse until well chopped. 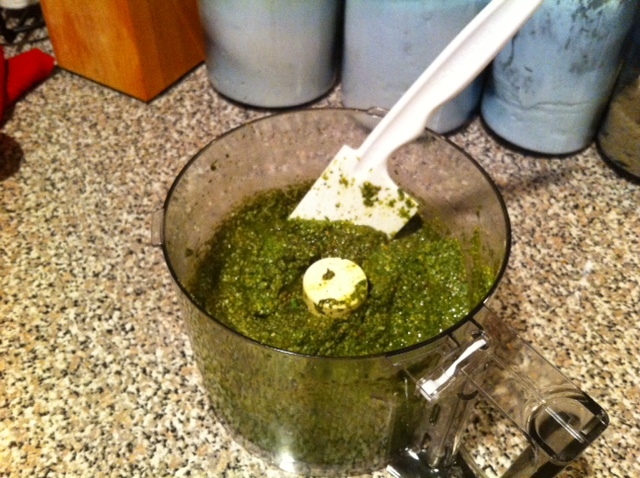 Then, turn the food processor on, and slowly add the olive oil until well-blended. Add the shredded cheese and pulse a few times to mix– not too much, or the blades will heat up and cause the cheese to melt. Add salt and pepper to taste. Serve over hot pasta, or on top of bruchetta, or in a spoon into your mouth. 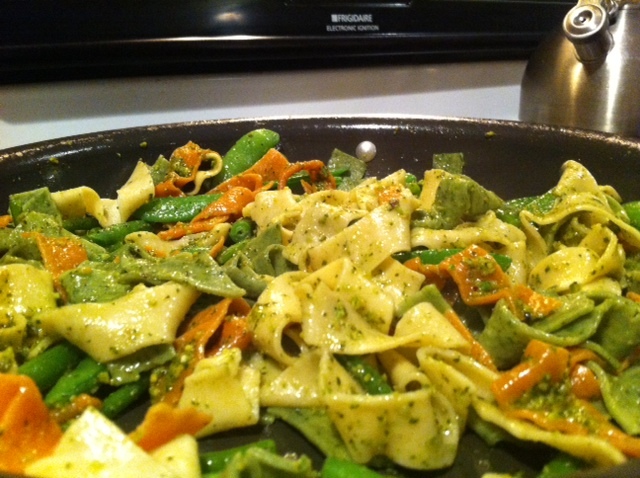 We put our pesto into a fresh tri-color ribbon pasta with blanched sugar snap peas, green beans, and garlic scapes.